Remember this? 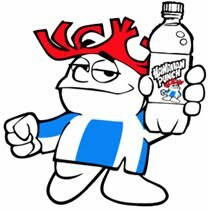 How's about a nice, Hawaiian Punch? I don't know why this little guy's been on my mind lately! I remember him fondly...its funny what pops into your mind. My 7yo joked 'want some punch?' the other day... and she's never seen these commercials, nor so we drink any sort of punch! Amazing how some things stick around.